BRISTOL SHOW 2012: Sansui returns to UK with new hi-fi range – video report | What Hi-Fi? This year's Bristol Sound and Vision show sees the rebirth of a familiar hi-fi name, as Sansui Electronics UK launches in Britain. Sansui Electric of Japan was a familiar name on amps and receivers from the 1950s through to the late 1980s, but hasn't been seen in UK shops since. Now a new management team is relaunching the Sansui brand in the UK with a wide range hi-fi components, from a traditional CD player and amplifier to a network player (pictured above), streaming microsystem, internet/DAB radios and even an audiophile PC sound card. The Sansui WLD-201 network player (£399), which can be used either hard-wired or via wi-fi, also includes a DAB/DAB+ radio tuner. It supports streaming of a variety of music file formats, including FLAC (up to 24bit/96kHz), WAV, AAC/AAC+, MP3, Real-Audio and WMA. Its USB input gives you further playback options, while further flexibility is offered by RCA, optical and coaxial outputs. Also offering a range of streaming options is the Sansui WMH-700L wi-fi microsystem (pictured above alongside Sansui founder, Mr Kikuchi). This also includes a DAB/DAB+ radio tuner, plus offers CD playback and a headphone socket. It costs £499, including speakers. Next up is the Sansui SAV-60, a stereo amplifier packing a valve pre-amp plus an integrated DAC, a phono stage and a headphone socket. The £599 amp is a 100W-per-channel design with six analogue and two digital inputs; it comes with a remote control, too. Another amp/DAC combo is the £299 Sansui SAV-201V, a 40W-per-channel design also offering a headphone socket and remote control. It is designed to match Sansui's sole CD player, the £199 CDD-201. You can see the separates stack below. The networked products and DACs are just the start of Sansui's computer-based music ambitions. Also new are an audiophile PC sound card - the Overture - and the Muse wireless music system. 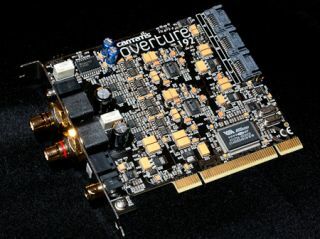 The Overture (pictured) is a 192 PCI soundcard with twin Burr-Brown PCM1794A DACs running in dual-mono mode. The card claims to use audiophile op-amps throughout, plus ultra-stable clocking to reduce digital jitter. The Overture features optical and coaxial digital outputs, supporting bitrates up to 192kHz. It will cost £249. The Muse, meanwhile, is a £69 USB device that will transmit your computer's music library over a high-quality FM frequency to any FM-equipped radio/tuner/receiver around your house. It can be controlled via a range of music apps, including iTunes Remote. Rounding out Sansui's new UK line-up are the £60 DB100 DAB/DAB+ portable radio and the £99 WTR-100 Internet/FM radio. Both feature built-in rechargeable batteries. All product are available in a black or silver finish and the network products can be controlled via Sansui's free Libretto app (available from the Apple App store). Paul Mitchell, managing director of Sansui Electronics UK, says: "We are very excited about the range of products we have developed and have received a very positive response from the market so far. We feel the time is right for a brand to make quality leading edge technology available at affordable prices". We hope to test some of the new line-up very shortly.